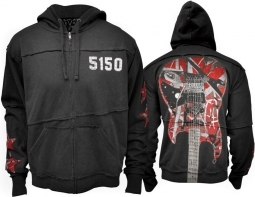 Custom Eddie Van Halen hoodie featuring the guitar that changed everything! Raw edge stitching on the hems makes this zip hoodie a very unique item. We're sure this will be your new favorite hoodie! Out of production & limited supply. This is hands down one of the best things I have ever purchased from vanhalenstore.com. I have owned it for many years now and it is as good as the day I bought it. It is my go to outerwear for cooler weather. I love the design and almost always get comments from =VH= and music fans. In fact I might just have to pick up the second version of it. Highly recommended. My wife bought me this hoodie and it is very soft and looks great. It’s was a little big when I got it, but after a few washings it fits perfect. People are always asking me where I got it and I always refer them to the VH Store! The guitar design on the back is amazing! Great product for any fan to have. Awesome fit, stitching and, my, that GUITAR! LOVE this. It's a great mid-weight fabric that's soft and comfy. The guitar fills the entire back - so cool. And the stitching, especially around the cuffs, makes it look like truly high fashion. This is perfect for the fall weather (and winter in the South). I ordered it in my own size and it's loose enough that I can wear a sweater under it.